50650-RB is rated 2.2 out of 5 by 5. Rated 3 out of 5 by LuckyMan1 from Delta Customer service is the best! I have used this product for 7 years and it has failed. Called Delta and they are sending out a replacement. These guys have my loyalty because of there customer service. None better in any business. They always seem to do what needs to be done to make the customer happy. Rated 2 out of 5 by Arnos from Unit is attractive. We had this unit installed as part of our bathroom renovation. It was made by Alsons Corp., a company that Delta has bought. From the start, setting the diverter to allow use of both the shower head and hand-held units was VERY difficult. Occasionally, the unit would slip out of that combined position and to reset it was a bear of a job! Recently, it has stopped holding in the combined position, no matter how often we set/reset it. The method for setting the position is rather dumb in my opinion. We won't be replacing this unit with its similar counterpart. The lever type of setting makes more sense, but from one review I've read, the lever is made of composite material, whereas the rest of the unit is made from brass. From experience, I simply don't trust composites. So I'll be looking for another brand for replacing our unit. Rated 1 out of 5 by dedkrd from Great at first... I have had this diverter installed along with my delta shower head for a little over a year and now I can barely pull the knob out. I have to get a step stool to get above it to get some leverage and even with that the know only pulls out part way so there is hardly any pressure coming from the handheld at all. I can barely rinse the walls down with it. I thought it was great at first but now it's a complete waste! Rated 2 out of 5 by B52Gary from Hard to use From the time the item was installed with a new shower setup it was very hard to operate. My wife was unable to get it work numerous times. I finally called Delta and they are sending me a replacement unit, hopefully this one will work better. Think I would recommend the units with a lever to switch between modes versus this one with the button. Rated 3 out of 5 by MikeNTxs from Get the U4929 Diverter Instead The 50650 diverter does the job, but based on our one-time experience, it's hard to use. My unit came out of the box very stiff to operate. I had to lubricate it with silicone spray and gel. After working that in for some length of time, it operated smoothly enough for my wife and I to operate easily, and remained so for about 4 years. When it stopped working properly (jamming, and not fully diverting), I contacted Delta and they honored their life-time warranty with no hassle. They offered me a choice of replacing the same diverter or trying a different one, the U4929. Based on Amazon reviews, I took the U4929 and have not regretted it. The design of the leverage for the 50650 is all wrong for the typical application, pulling in-out from an elevated location. The U4929 is ACA-approved, and is incredibly easy to operate with the flip of a lever. It's absolutely the best option. As regards the 50650, after exploring the mechanism, my suspicion was confirmed that an O-ring slipped out of place, causing the final problems. (I have not found a way to fully disassemble and repair it without serious damage to the diverter finish.) It's possible that this O-ring was never positioned exactly right, causing the initial stiffness. Be that as it may, if you need a diverter, buy the U4929 in whatever color you require. I believe you'll be extremely pleased. How do I switch from shower to hand held shower? I have tried pulling but seems to be very tight. How to remove the old 50650 diverter from the shower head? Does this diverter allow for water to come out of both the shower head and the hand-held sprayer at the same time? Read more: http://www.deltafaucet. This question was already asked multiple times and the answer given by the Delta employee was yes, but I believe the answer is wrong. I purchased this diverter after reading that it would allow water to come from both the shower head and the hand-held sprayer at the same time. After installation, I am unable to get water from both outlets at the same time. It is only one or the other. There is no way of holding the knob in the middle position to open both outlets at the same time. The water pressure forces it to one side. Was the information wrong or did I install this product wrong? Thank you for your question. I apologize that the information that was previously communicated was incorrect. Delta Faucet model #50650 will not divert to both accessories. Delta Faucet model #U4923-PK will divert to both. A member of our team will be reaching out to you to make the purchase right. What is the difference between Model No. 50650-SS and U4923-SS-PK? 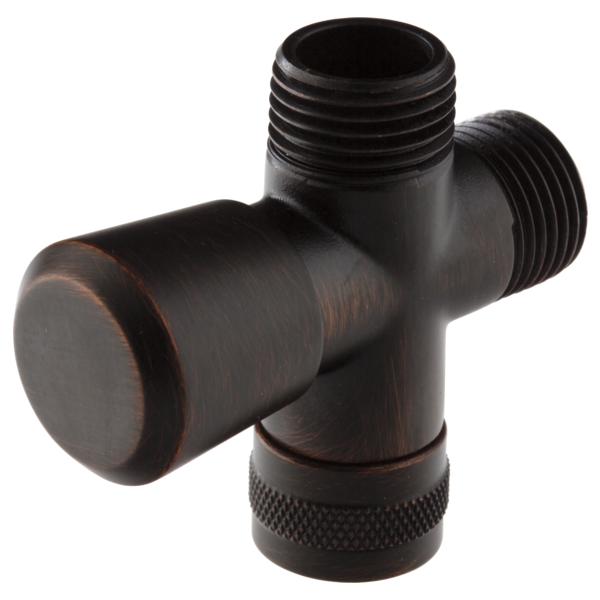 Can the diverter be installed before the shower arm directly into the plumbing pipe so that the hose for the handheld lays more neatly against the shower wall? Does this diverter allow for water to come out of both the shower head and the hand-held sprayer at the same time? Thank you for your question. Delta Faucet model # 50650-SS is a diverter that is attached in between the shower arm and the shower head. When pulled up, it will let the consumer use either the showerhead or the handheld shower or both at the same time. How does this diverter work ? Do you pull up on the control or turn to divert the water ? Thank you for your question. Delta Faucet model # 50650 can be pulled up to operate either the handheld shower or stationary showerhead seperately or together.